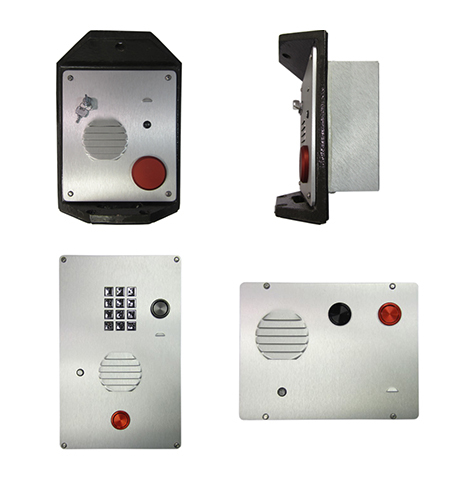 Ramtel phones provide peace of mind in knowing that Safety and Security are of serious concern. Assistance is a phone call away. The use of a personal cell phone is used for so many purposes. It does not guarantee that a person using the phone will be aware of an emergency alert being sent. 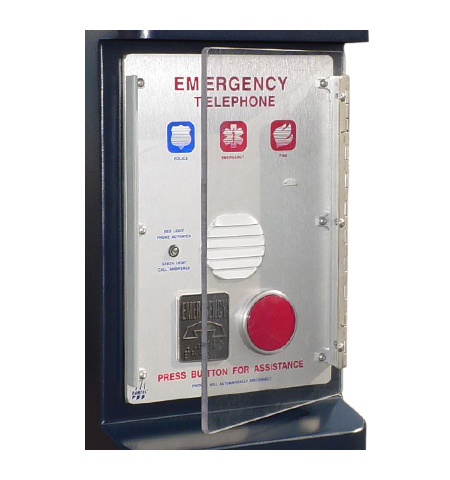 The One Button Hands Free Phone provides two way communications for Emergency Assistance. 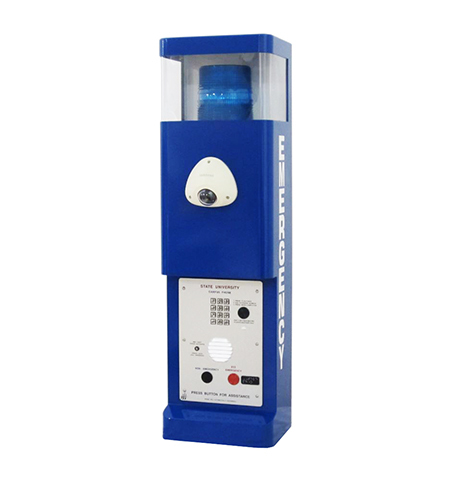 The Dual Purpose Phone includes a keypad for manual dialing and One Emergency Auto-Dial. Auto-Redial of Three Additional Numbers, if line busy or no answer. Emergency Override on Call in Progress. Emergency Call in Progress Cannot be terminated. Auto-Answer feature allows for call back and monitoring of area. Voice and location identification signal. 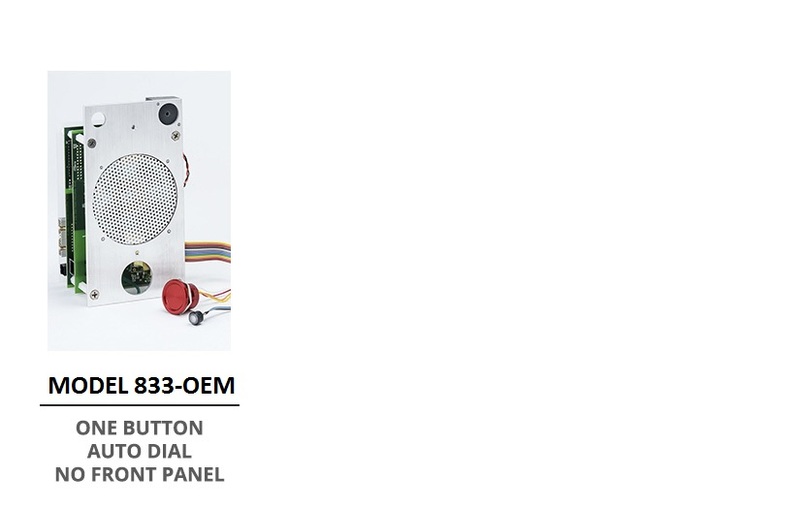 “Red” indicator light automatically activated when any button on Ramtel phone is pressed, and changes to “Green” when call is answered. Braille Plaque includes International Phone Symbol. 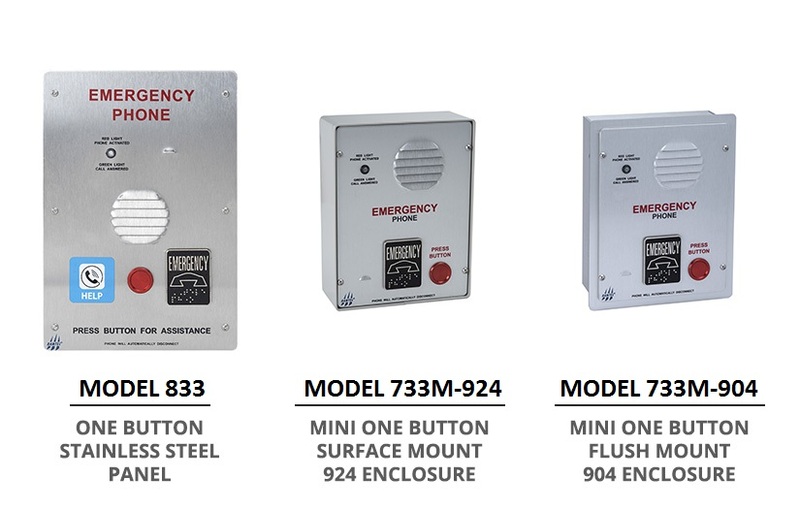 Emergency button external output control. (i.e. 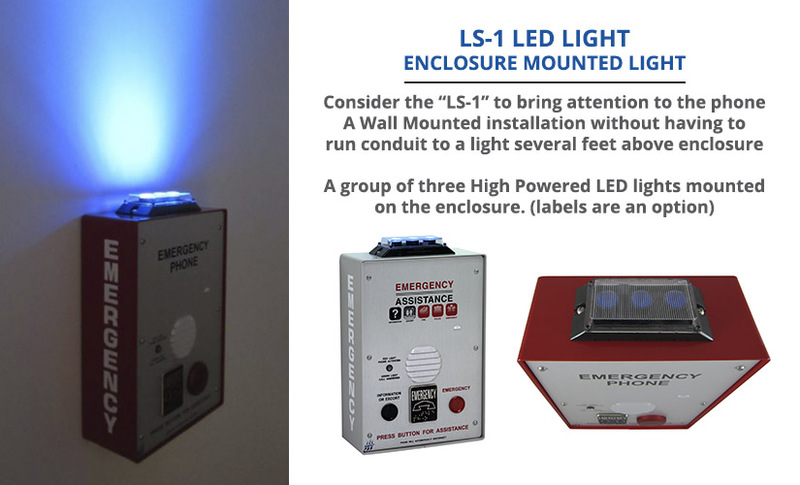 Blinking or Flashing Strobe). 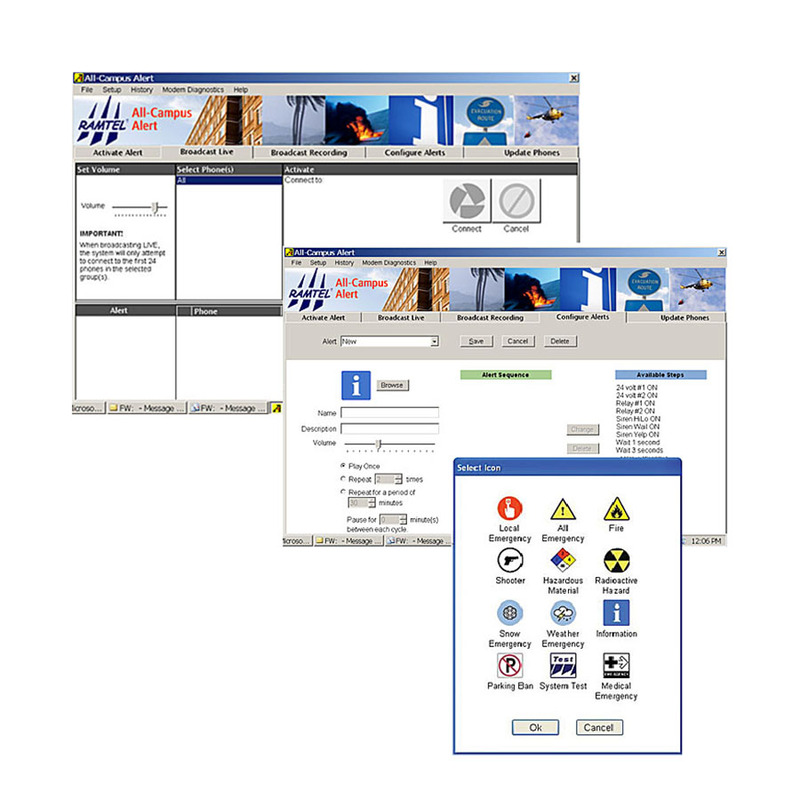 Six miscellaneous External Output Control capability. (Activated by keypad and controlled by called party, i.e. 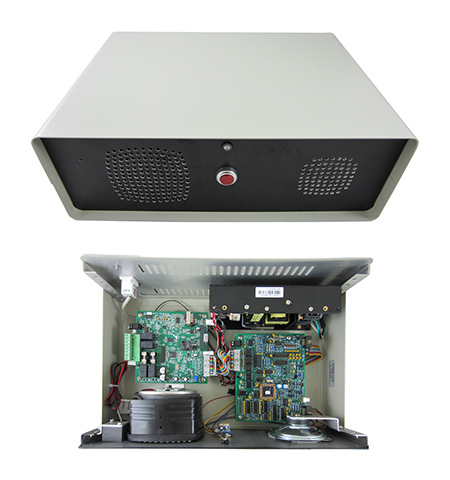 release door/gate, turn on and control a top mount surveillance camera). 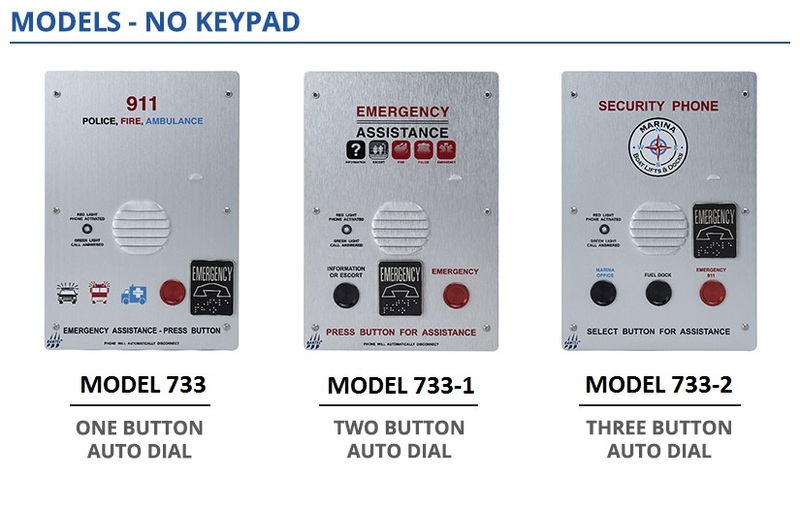 If person(s) in the elevator need assistance, they simply push a button to activate the call to Security. At any time, Security can call phone in that elevator, to automatically open the connection and talk with person(s). 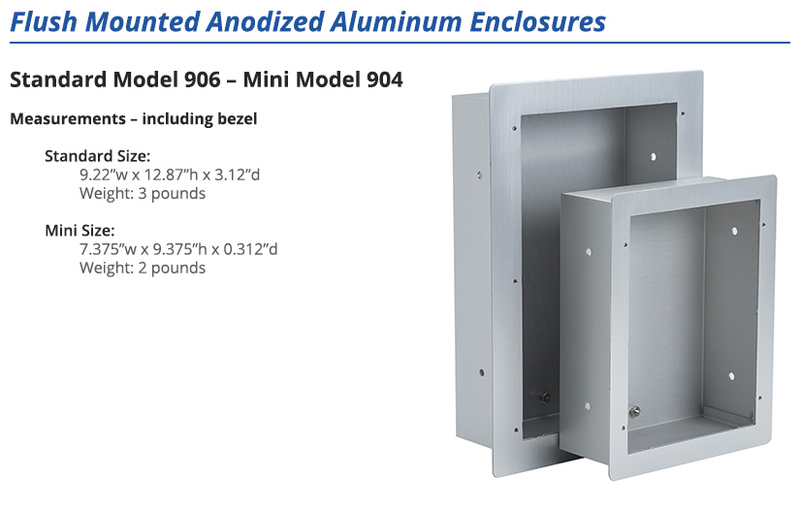 Standard size phone Surface mounted in telephone cabinet, with door removed. 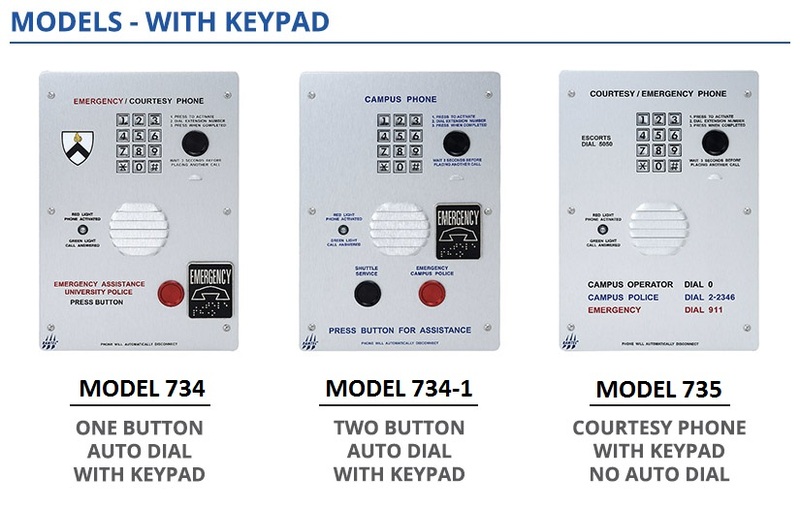 Ramtel specializes in Standard and Custom Silk Screened phone panels individualized to your needs. Ramtel specialized phones serve a specific purpose. 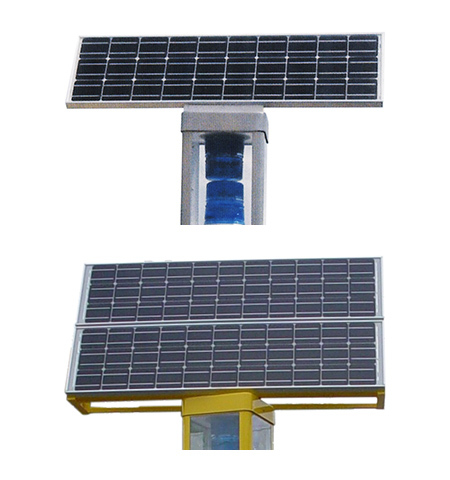 The engineering design, fabrication quality, high power LED lights, labeling on all sides of a Stainless Steel column, and custom silk screened phone panel cannot be compared. 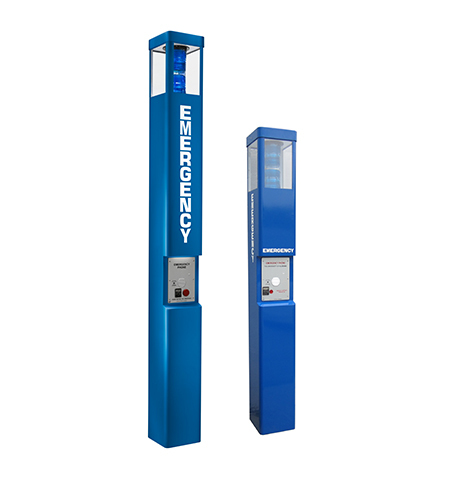 As you walk along Campus grounds, these High Powered LED Lights (generally blue) shine brightly, directing a pathway to phone assistance with emergency connection to Security…. you feel safe. 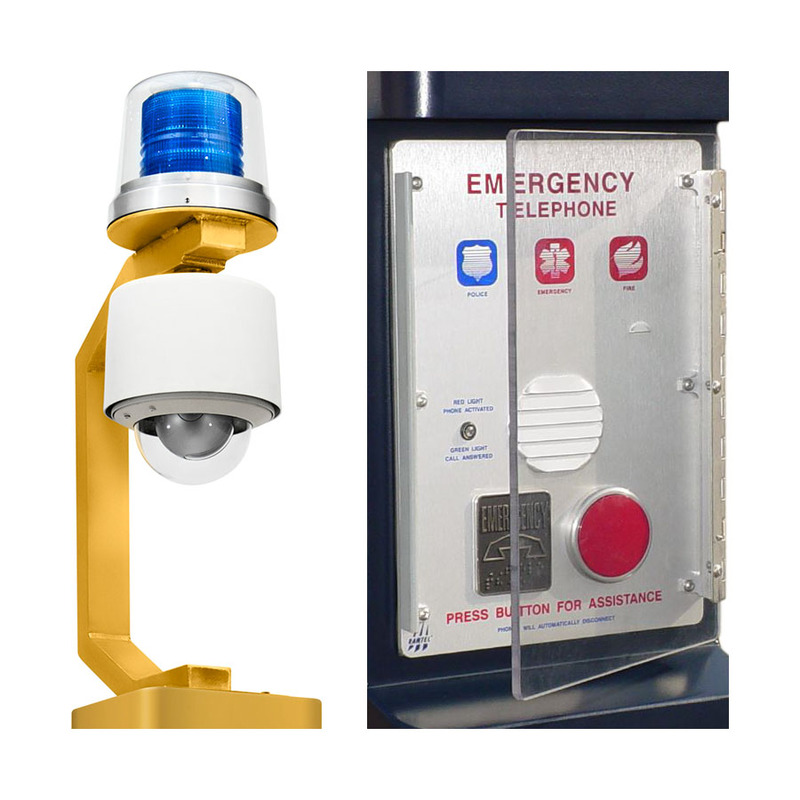 The flashing light is activated when Emergency Button on Ramtel phone is pressed, and stops flashing when call is completed. 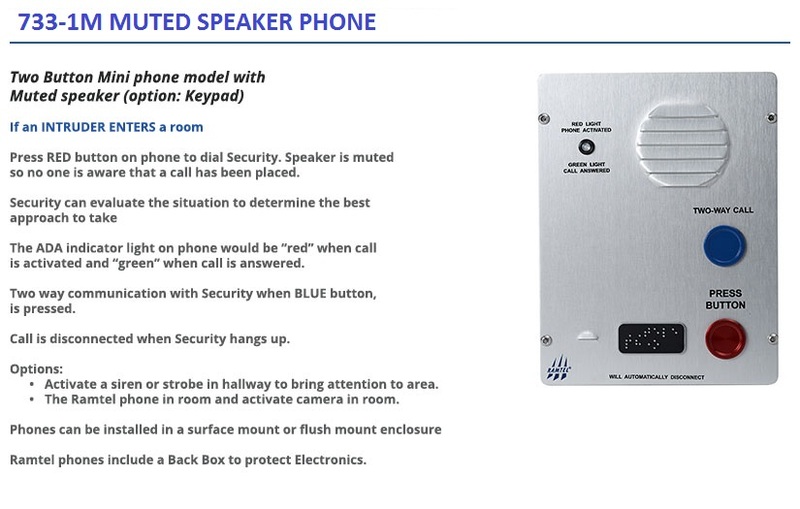 A Computer Based Program utilizing existing phone lines and RAMTEL Phones through high powered concealed Public Address Speakers. What is RAMTEL’S ALL-CAMPUS ALERT System? RAMTEL’S ALL-CAMPUS ALERT SYSTEM is a computer based program that utilizes existing phone lines and RAMTEL phones. What can the system accomplish for your campus? 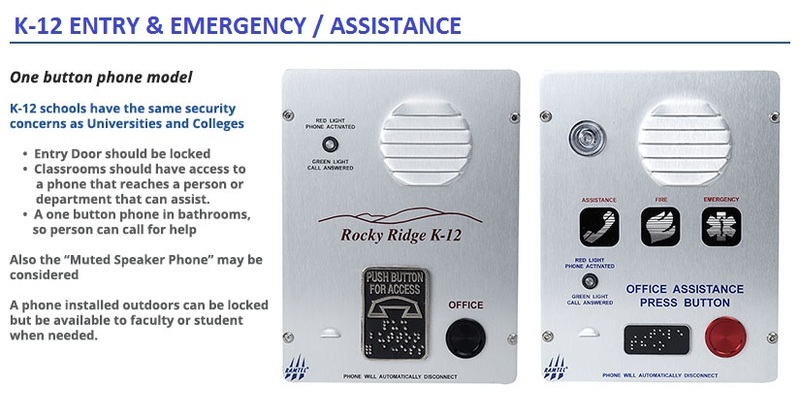 Why is RAMTEL’S ALL-CAMPUS ALERT System different from other alert systems? System utilizes existing hard wired phone lines. 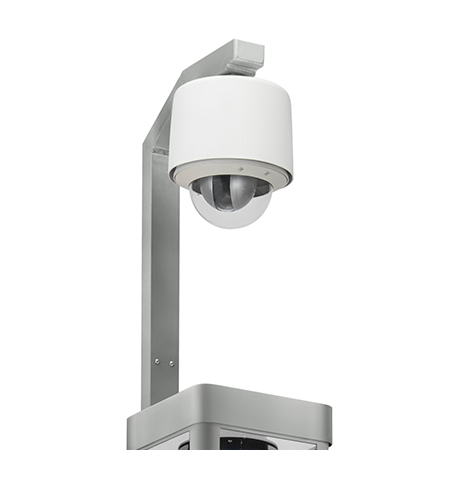 System is cost affective and provides a campus wide alert warning. 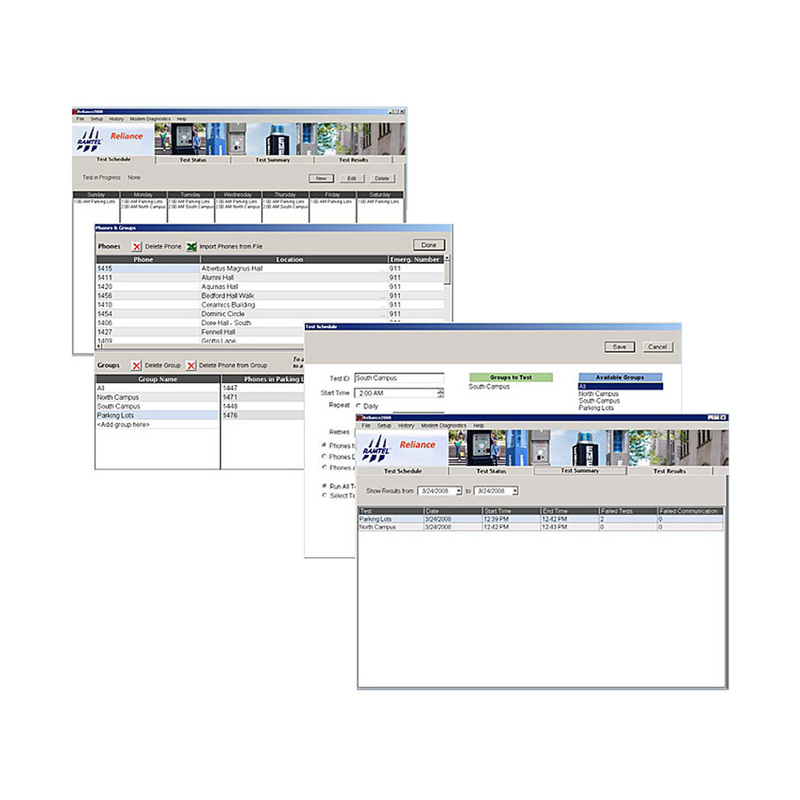 Eliminates confusion, ambiguity of text messaging, voice message to cell phone or email being sent by campus personnel during an alert situation. The RAMTEL System includes a SERVER GRADE COMPUTER with modems, software and U.S.B. Microphone. 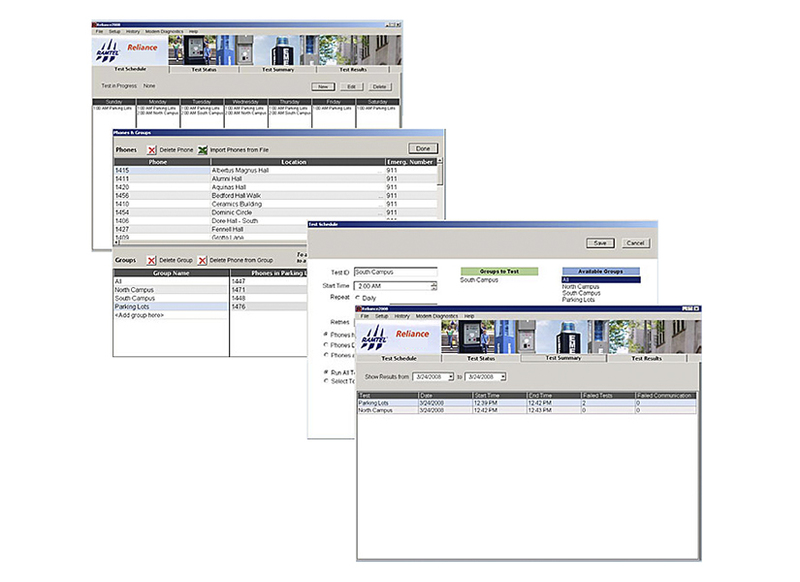 Once the data has been entered into the computer, the screen will display “Sequence of Events and “Groups of Phones” to be activated simultaneously. Program phones to be called in groups of 24 phones at one time. Once program is activated, each 24 phone group sequence takes 10 seconds. Computers can be networked and is password protected. Alert sequence in process can be turned off manually. 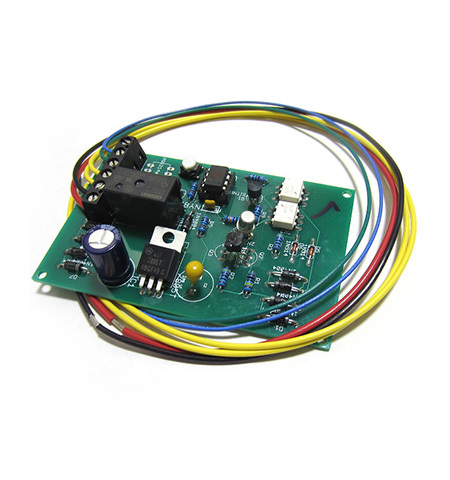 For added protection, the Control Board has a back up timer. How does the RAMTEL computer based system work? When the ‘Alert” is activated, the commands are sent through the telephone network to the groups of RAMTEL phones, then to the Control Board that stores the information. Is the announcement made through the speaker on the RAMTEL phone? 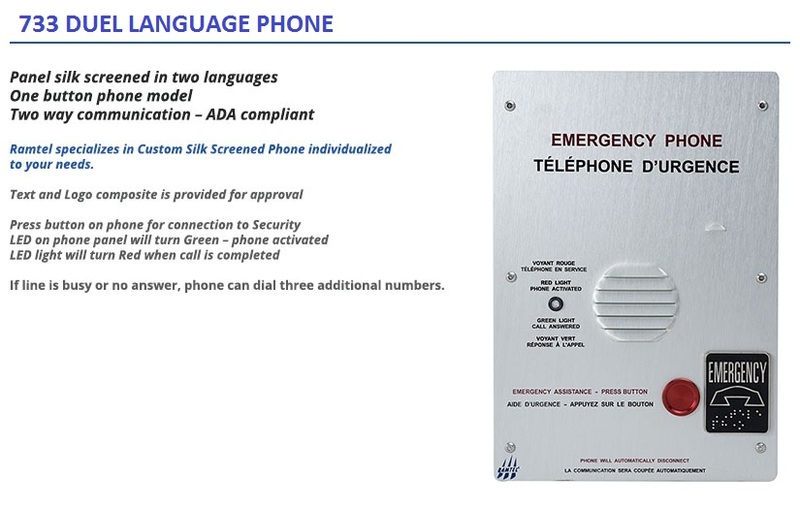 The RAMTEL phone is used as the vehicle to send message to the Control Board that stores the information for an alert activation. 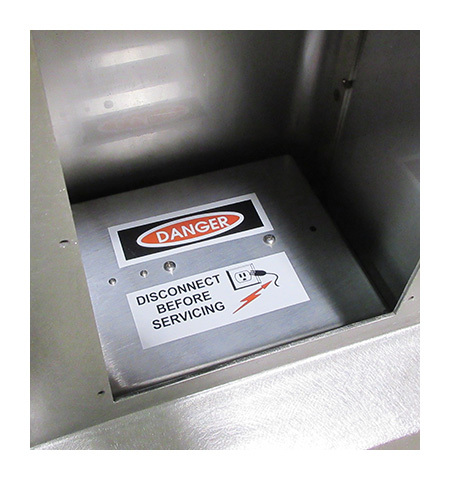 The Public Address speakers and a Control Board are installed in a retro-fit cap for the Stainless Columns and in a tamper proof housing for surface mounting. Sixteen Manual Volume adjustment in software. 2 speakers for surface mounting with RAMTEL phone and Wall Unit. What are the guidelines for Live Messaging? Live message can be announced to a group of 24 phones. Live recorded message can also be saved in a file on computer and activated to all groups of phones – 24 phones at a time. Can the RAMTEL phone be used during the Campus Alert? 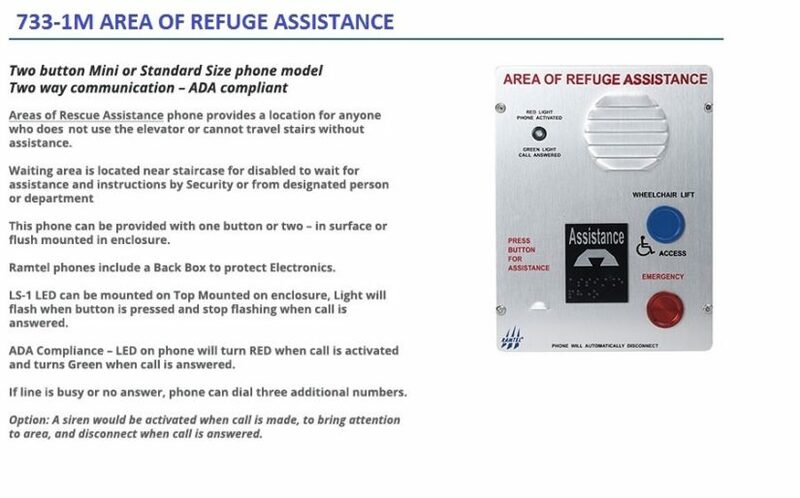 The RAMTEL phone can be used during an alert. The Audio Alert (Siren and Message) is temporarily interrupted. When phone is back on hook, the audio sequence will be re-activated through the duration of alert sequence. Does the All-Campus Alert System work only with RAMTEL phones? 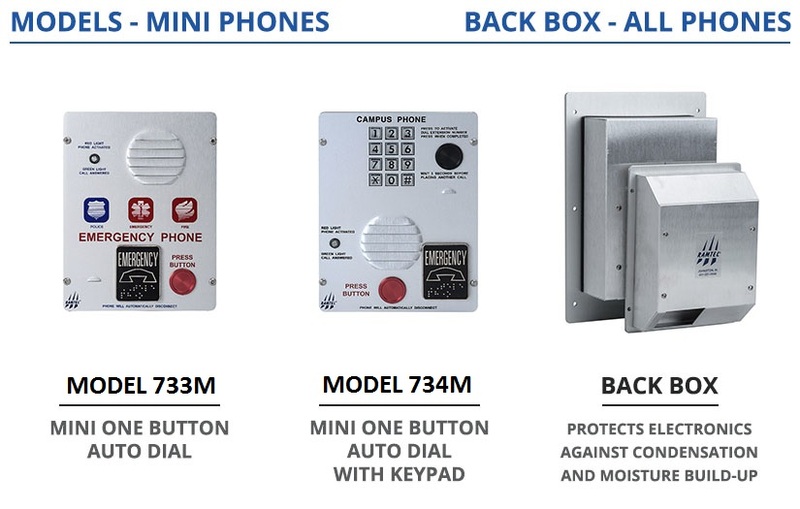 Yes, the design of the RAMTEL phone includes the necessary electronics for the All-Campus Alert System. Can the system work with both RAMTEL Old phone models and the new Micro Processor Based phone models? No, only MPBP phone models can be retro-fit for the system. 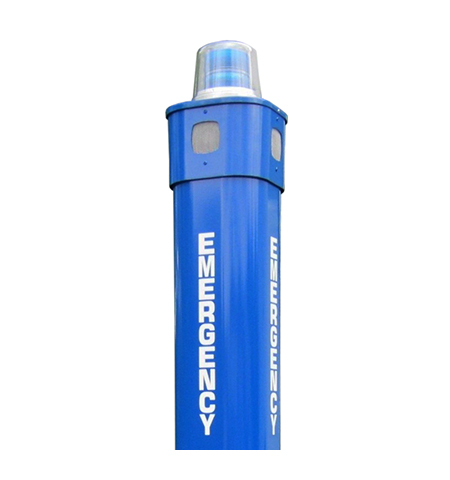 Can Existing Columns be upgraded to All Campus Alert? Can the system be tested? A “test message” and “sequence” can be sent to “groups of phones”. Phones can be polled 2, 4, or 8 at a time. 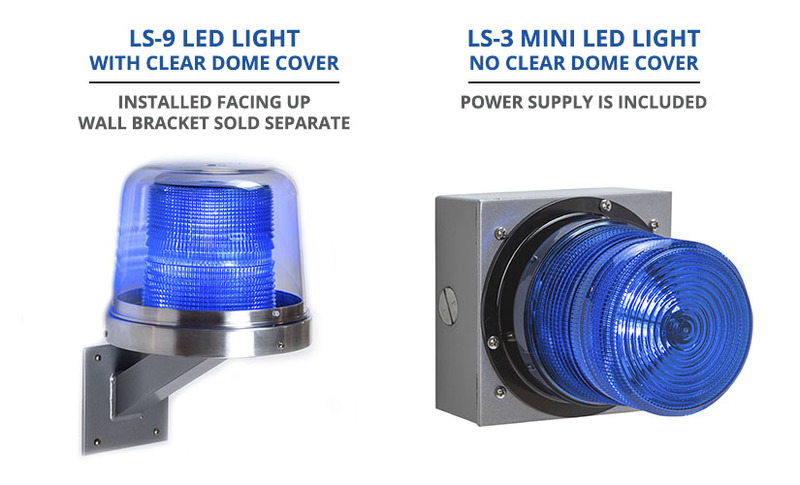 Installation: Top & Side Mount. 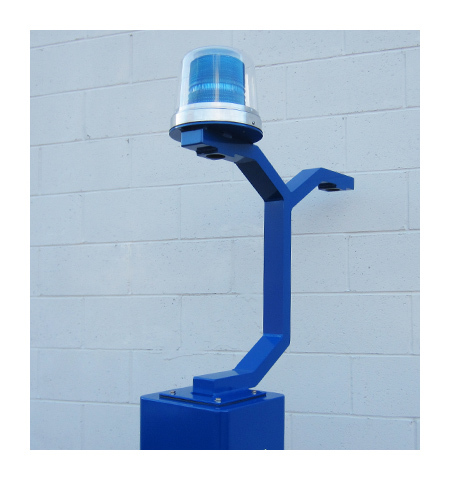 Strobe Light mounted on top of bracket. 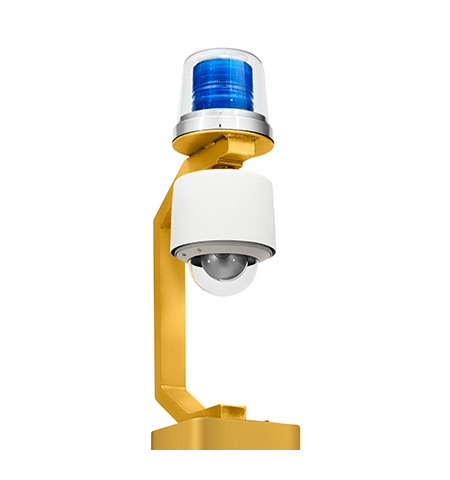 360 degrees of continuous viewing with no obstruction. 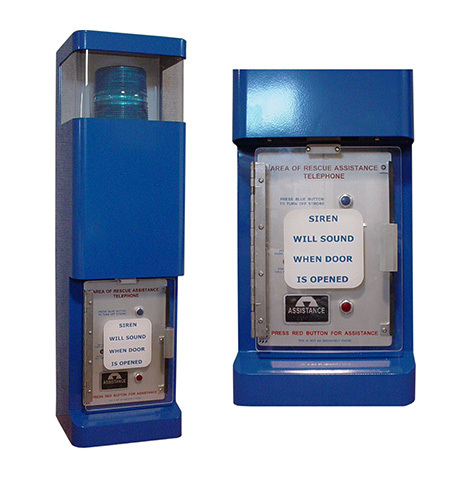 Siren is activated when Emergency Button on phone is pressed and brings attention to the area. 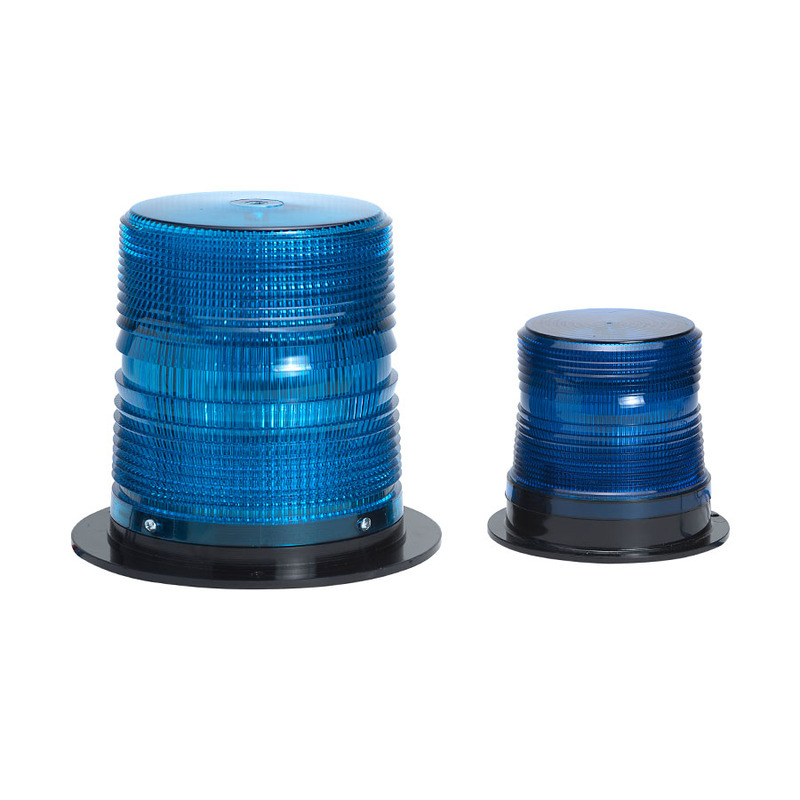 Siren is deactivated when call is answered, so not to conflict with communication. 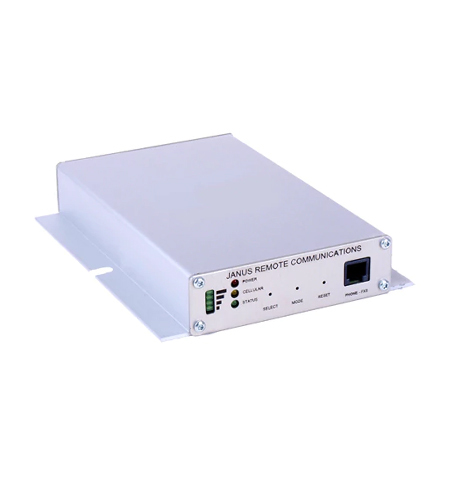 Provides a Cellular phone connection when a standard Analog telephone line is not available. Press Button on phone, light flashes and camera turns ON. Camera disconnects when call is complete. 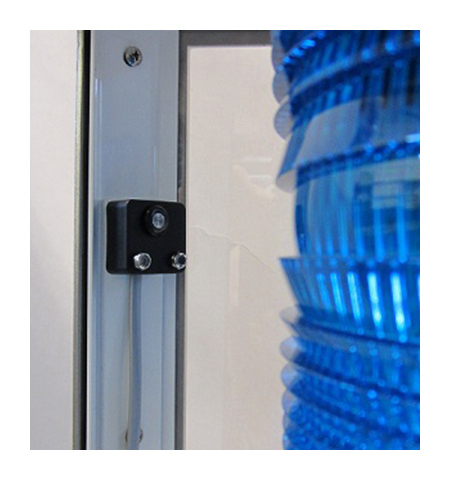 Protects against walk-by button activation. 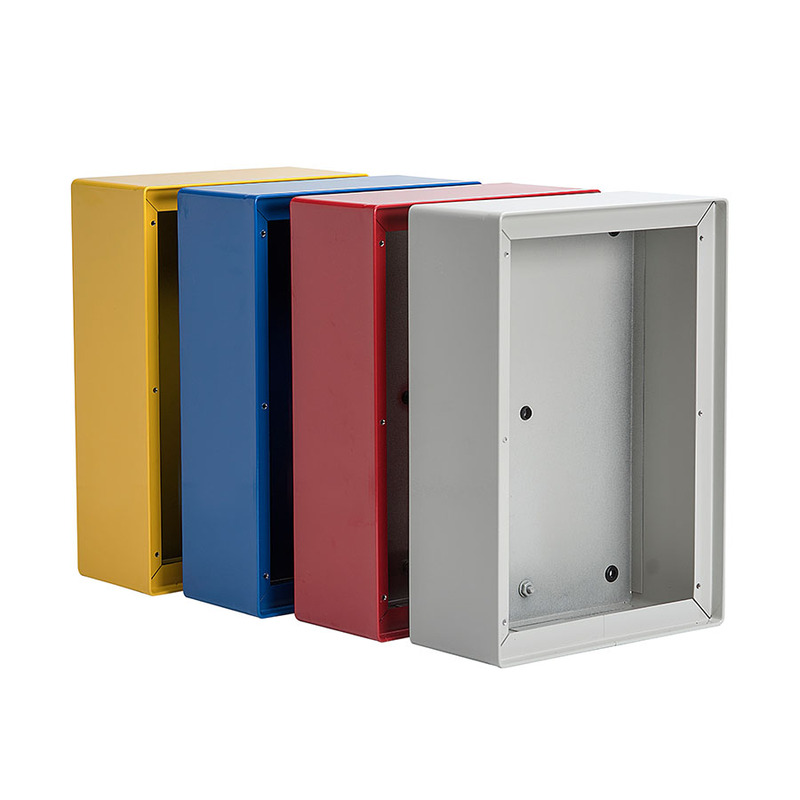 Can be used on Columns, Wall Units and Standard Phone Enclosure. 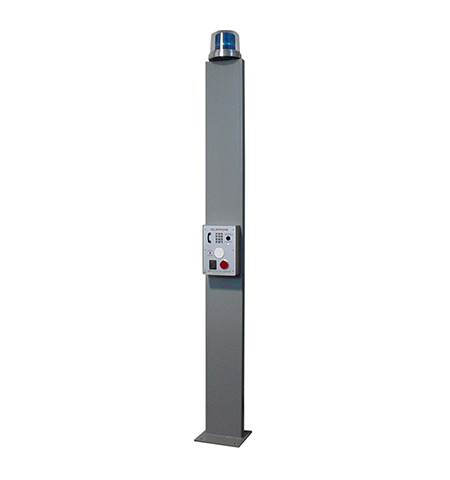 Reduces the buildup of snow and ice accumulated in front of the phone area of column and wall unit. Alaska insulation option: For extremely low temperature. 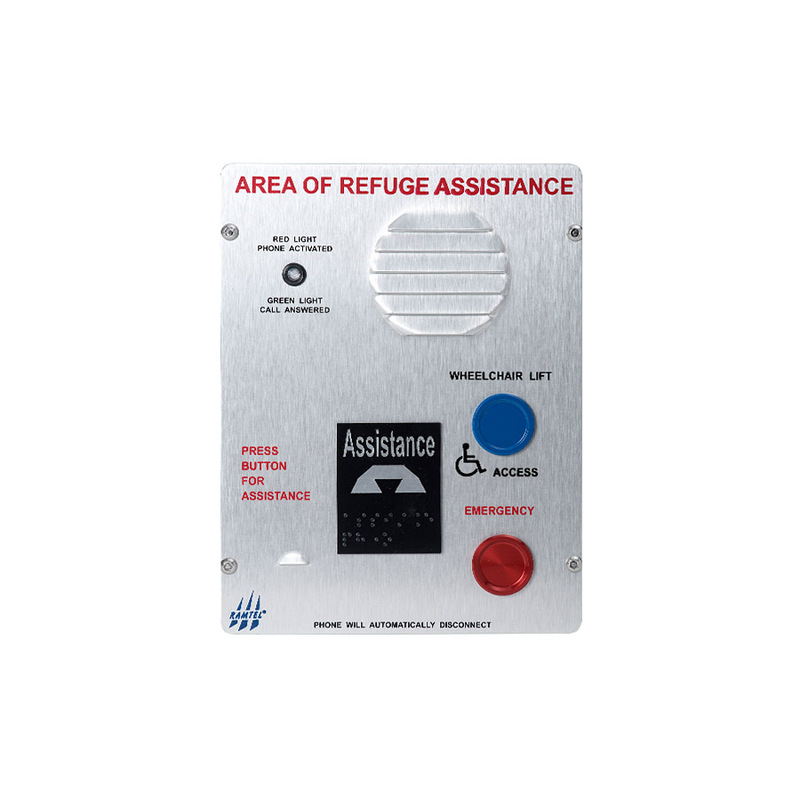 This large red button is visible and easily activated: A reliable connection no matter where the button is pressed. Essentially four switches in one. One of the “check functions” used with Reliance Polling/Diagnostics Software to indicate if blue light is ON or OFF in Columns and Wall Units. When there is a break in phone line. 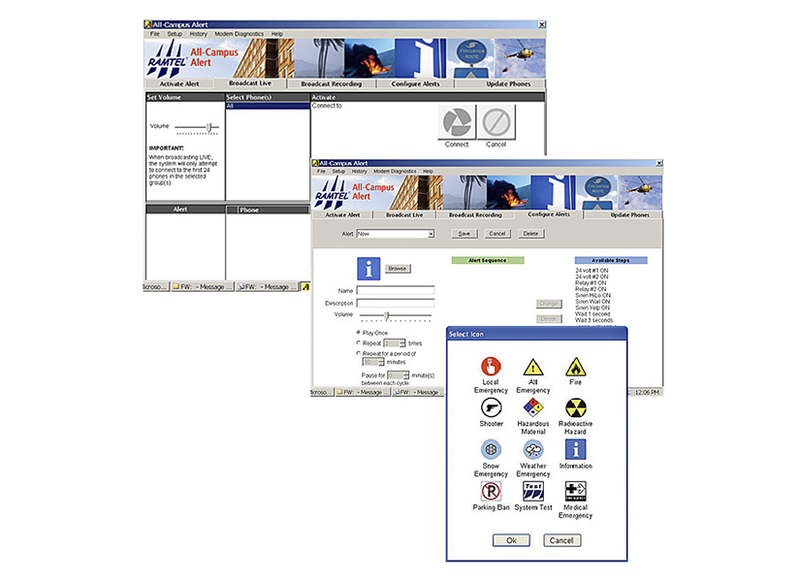 A line connection is verified once every minute and twenty-five seconds. If line is broken or disconnected in any way, an alarm is set off at main control station. 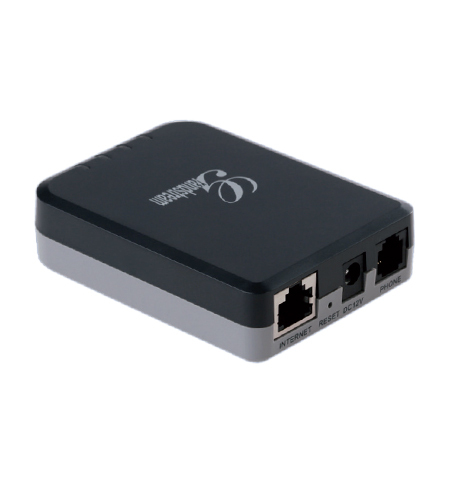 When a Gateway is not available in your switch, consider a Ramtel VoIP option which enables users to take advantage of VoIP on your analog phones. 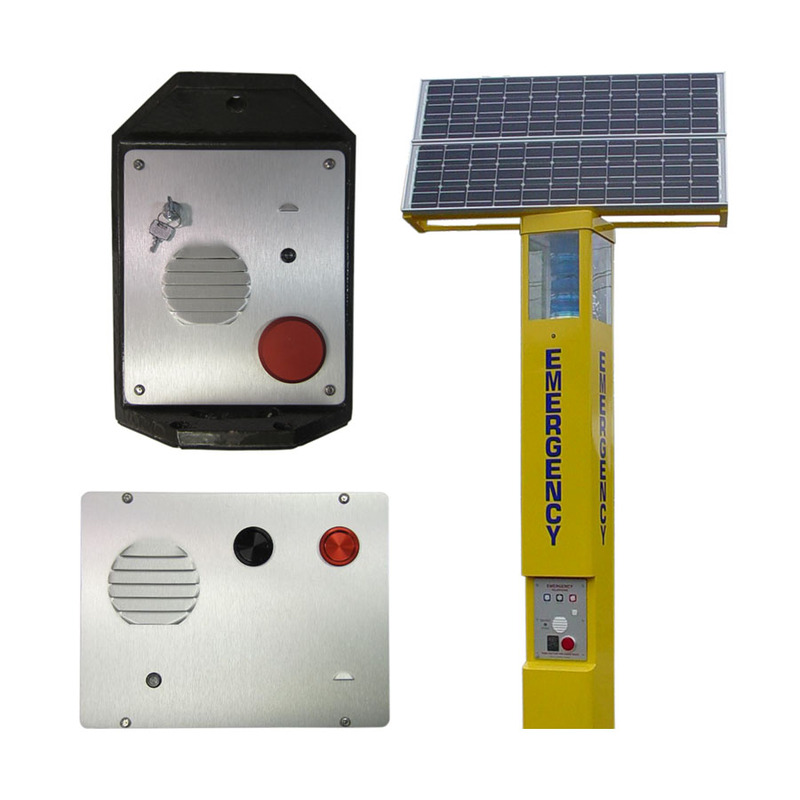 Provides sufficient battery power to operate Ramtel columns and wall units during the daytime. 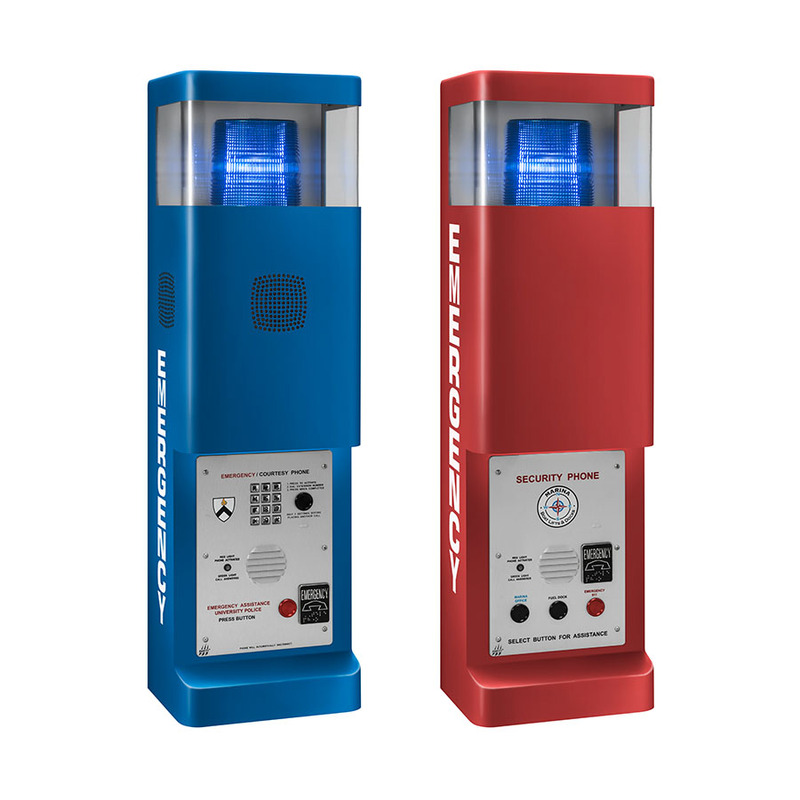 During the nighttime, units can be powered from 600v AC, 480v AC, 277v AC, 240v AC, 208v AC, or 120v AC power network. 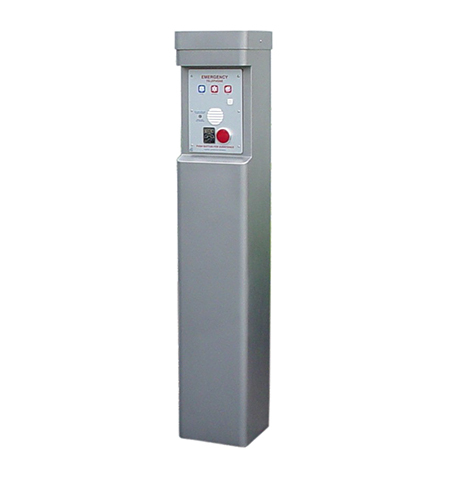 In the event of a power interruption, the column will switch to battery power. Custom products and services are, by definition, unique. Each is produced individually; usually to meet a size, color, style, and purpose. 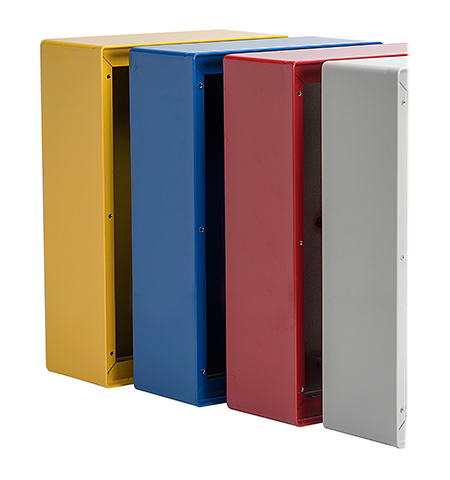 Custom products are generally one-of-a-kind items, but many times it becomes part of a Ramtel standard. 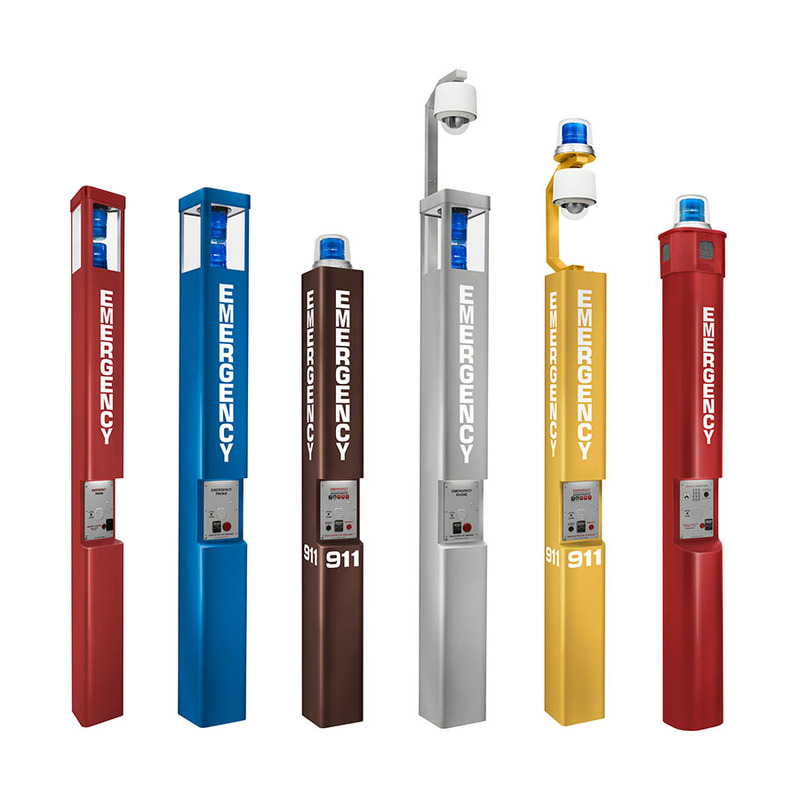 Call to discuss Ramtel’s expertise in custom requirements. 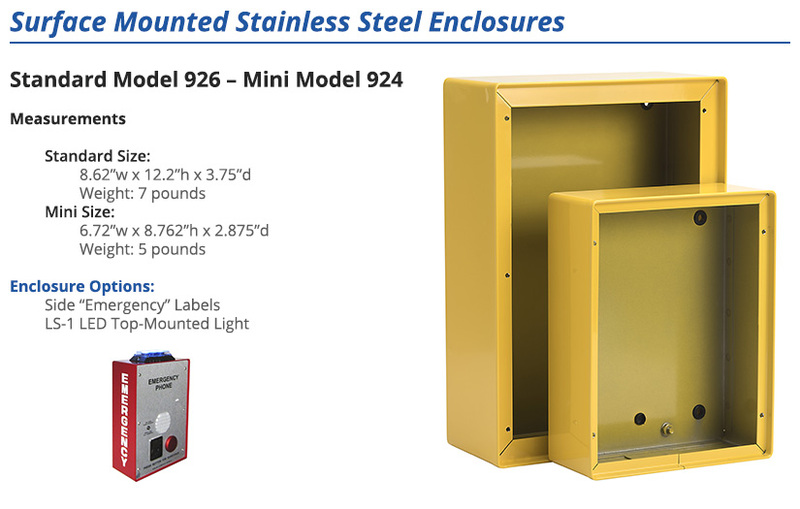 Horizontal, Slim Vertical, and Specially made panels to fit every need and enclosure. 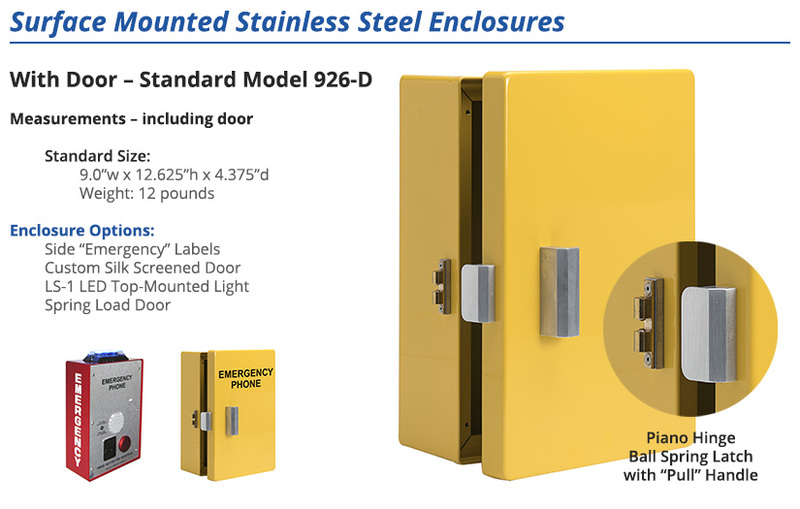 Clear Lexan Door, Silk Screened with special operating instructions. Contact Ramtel for more information. Parking garage so light can be seen from a distance above rooftops of trucks, SUVs, and cars. 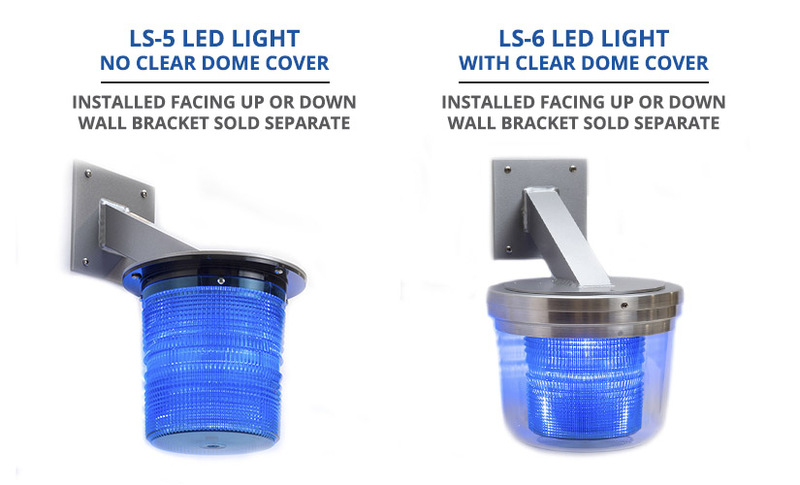 Open area in center of parking garage with light visibility shining brightly in four directions, reducing the number of wall units required.